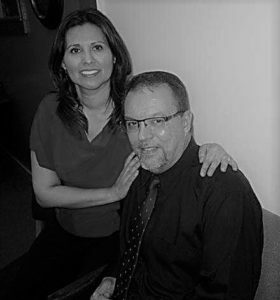 John Davis is an Army veteran turned IT professional, and Leticia Davis has worked in early childhood education for 20 years. The two have been married for almost three decades, and they are now looking to transition into the field of cybersecurity — as a couple. When John and Leticia went to a PTAC class to learn about government contracting, they met Rim Technologies CEO Sara Kinney. It was a fortuitous time to meet: Rim Technologies has been offering a series of bootcamps this summer to help individuals pursue IT certifications such as Security+, CISSP, and CASP. The courses tie in with a scholarship program designed to help military spouses and dependents transition into a career in cybersecurity. “We met Sara [Kinney] giving a class, and she later invited us to attend her Security+ bootcamp. And we were already studying for it, so it was perfect. She was gracious enough to let us attend and to help us with passing that exam. John has already passed the exam, and I’m scheduled to take mine July 17. So I’m studying like crazy,” Leticia said. Leticia was offered a grant to continue pursuing her education while working at the Child Development Center at Pikes Peak Community College, which was what piqued her interest in changing career fields. She is currently pursuing a Masters degree in Management and Information Security and is set to graduate in October 2017. She said that meeting other women who already work in the field has been a great motivator for her as she studies. John just passed the Security+ exam, and Leticia is set to take it next Monday. They have been working and studying together as a couple, pushing each other to succeed. John, meanwhile, started his journey last year when he heard about a program with the VA that would help veterans get IT training. The program gave him access to an online course that offers a foundation in A+, Network+, and Security+, as well as vouchers for those who pass it. But it was his wife’s shared interest in the field that lead him to start working on it in earnest. “I finished the online program last year, and I had a voucher but didn’t pursue it until recently when my wife got involved, and then it sparked a fire and we’ve been pursuing it ever since,” John said. They have found their close relationship to be a major asset as they prepare for the exam. John has previous experience with IT, but cybersecurity is new territory for him. Both John and Leticia are now looking for entry-level positions in cybersecurity as they make their transition into the field. John agreed with her on the importance of getting practical experience. The two are studying together this week as Leticia prepares for her Security+ exam on July 17. From there, they’ll be pursuing their career transition the same way they prepared for the exam: as a couple.